Beyond Imagination: Where are the cows? A couple weeks ago, I heard the dogs barking outside my house. When I went out to investigate, to my surprise I saw a whole crowd of people...and in the middle was a friend from the States! Katie was leading a GetGlobal team, and they had just arrived in Papua New Guinea (PNG) to learn more about Bible translation. It was a delight to be able to catch up with Katie and have dinner with the GetGlobal team, where I could answer their questions and hear their stories. It reminded me of my own experience with GetGlobal when I was in college! GetGlobal is an opportunity for high school and college students to get a taste of Bible translation and the many opportunities where they could eventually become involved. These short-term mission trips can go all over the world, and often include a wide spectrum of activities, including village stays and ministry opportunities. Between my first and second years of college, I joined a GetGlobal team for a three week trip to Oaxaca, Mexico. It was an amazing experience and a great opportunity for me to confirm the call God had placed on my life to move into my current role as a Bible translator. Of course, if you have read this blog for any length of time, you won’t be surprised when I tell you that I emerged from that trip with a plethora of stories...from my experience learning to make tortillas (which made me worth two cows and therefore eligible for marriage) to my adventure in fainting. But, the one that sticks out the most was when I lost the cows. Enjoy! Agriculture and animals are an integral part of life of a Oaxacan village, so when Andrea, the daughter of my host family, asked if my teammate Lauren and I wanted to help her grandmother Francisca take the family’s goats, burros and cows to the campo, or fields, we quickly agreed. What Andrea neglected to mention was the shepherdess aspect of this job, and I began to be unsure of what I had gotten myself into when I saw her and her cousin packing far more provisions than needed for a ten-minute walk. Undaunted, however, I gathered my skirt around my legs and began to help drive the twenty goats (chiv), two burros and two cows (ngo’on) through the mud. 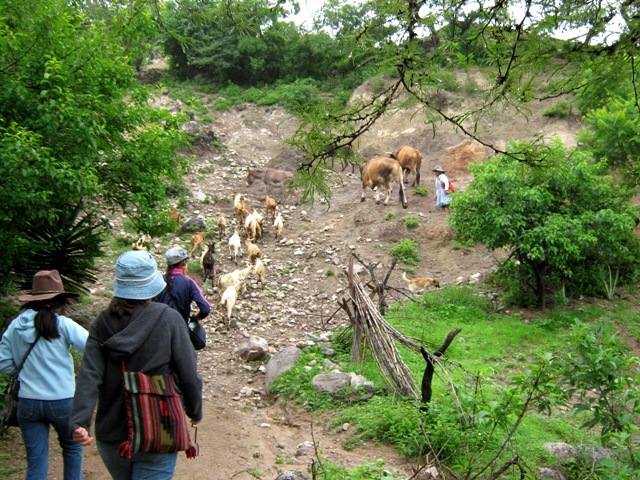 Thus began a six-hour trek through the mountains of Mexico in what ended up being a constant pouring rain. 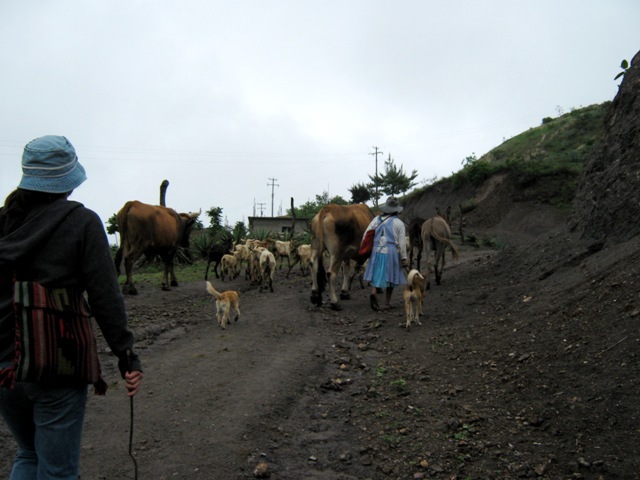 We scrambled over rocks, pushed through thickets, forded rain-swollen rivers, chased after straying chiv and hollered “cha’a!” when the burros dove for grass. All went well, until about three hours into our trek when I first heard, “Pa njo ngo’on?” We had lost our cows. 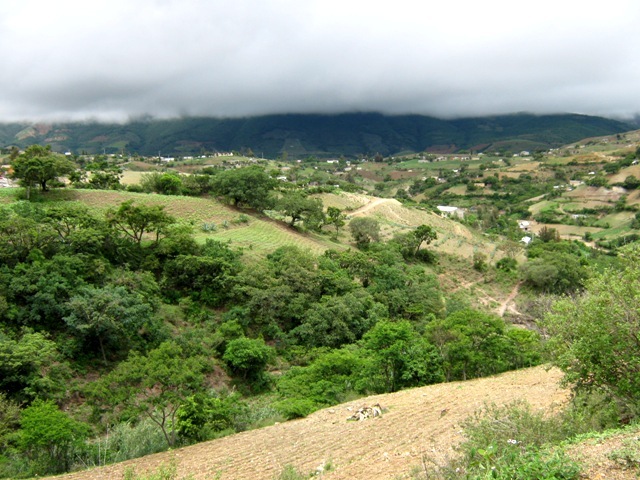 In the mountains of Oaxaca, the valleys descend sharply, slicing like a knife through the landscape, and are filled with thick vegetation, perfect for hungry ngo’on. While we attempted to keep the goats and burros gathered on high ground, the seventy-year old grandmother immediately charged into the underbrush, searching for her wayward cows. As I stood there on that mountain, water dripping off my hat and down my back, watching clouds rolling across the sky, I found myself thinking of the parable of the lost sheep in Matthew 18. The shepherd immediately leaves his ninety-nine sheep in search of the one which was lost, rejoicing all the more when it was found. Thos verses never meant so much to me as they did an hour and a half later when I saw the grandmother drive those cows over the hill – I don’t think I have been happier to see a cow in my life! That image of the tiny bent woman, with her tarp over her shoulders and her wide-brimmed hat searching for those cows without hesitation through the pouring rain, is a vivid illustration for me of the Father’s care, both in my own life and how He has searched after these villages hidden among the mountains of Oaxaca. Interested in going on a GetGlobal trip? Check out the Wycliffe website for more details. There are also longer, 6-8 week trips for older college students, called Discovery trips, which allow for an even more in depth experience of the many many facets of translation. We’d love to have you join us!